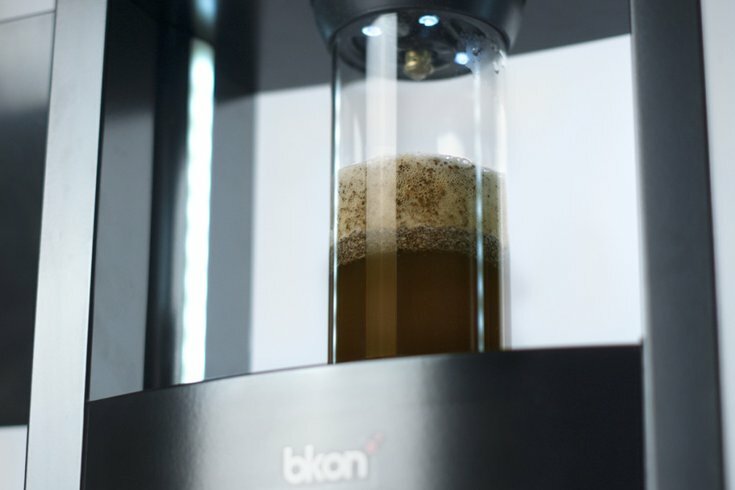 The BKON Craft Brewer, which brews craft coffee through algorithms. Two Philadelphia entrepreneurs -- brothers Lou and Dean Vastardis -- have developed and patented "Reverse Atmospheric Infusion" ("RAIN") technology that uses a combo of vacuumed air pressure and algorithms to create the perfect cup of coffee. That technology takes shape in the form of the "BKON Craft Brewer," which is essentially a craft-brew-focused Keurig that skips the use of disposable pods. Of note, the Vastardis brothers have already gotten Counter Culture Coffee, Whole Foods and Panther Coffee on board to create recipes for the device -- which extend to cocktails and tea, in addition to coffee. A cloud-connected machine, the recipes are stored in an accompanying tablet application that syncs with BKON, transmitting the code necessary to determine the correct amount of water and temperature. The brewer is priced at $13,250 and is currently only available in a handful of Chicago- and Los Angeles-area stores. The brothers hope to create a more affordable model for mass distribution in the future. Catch the full rundown on the machine and what it does via Wired magazine.